1939; 581 pages. Genre : American Literature. Awards : 1940 Pulitzer Prize for Novels. John Steinbeck received the 1962 Nobel Prize in Literature. Overall Rating : A.
Steinbeck's masterpiece, which chronicles the journey of a family of sharecroppers who, having been forced off their Oklahoma farm, travel Route 66 t0 California, in search of the Promised Land. What can I say? The book is worthy of the accolades that have been heaped upon it. Steinbeck demonstrates his storytelling skills in the chapters dealing with the Joad family; then demonstrates his writing skills in the intermezzo chapters that step away from the narrative and give you a more direct relating of what was going on in America during the Dust Bowl era. 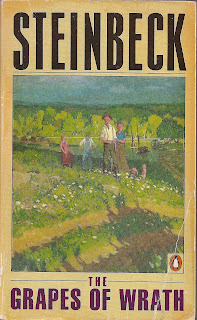 I especially liked the attention Steinbeck gives to minor characters. Like the cook and waitress (Al and Mae) at a nondescript truck stop in Chapter 15. Any other author would've just given them cursory attention, but Steinbeck makes them come alive. Indeed, the character development throughout TGOW is superb. These aren't two-dimensional people; they change and evolve throughout the book. Pa may lead the clan at the beginning, but by the end, it's Ma who is holding the remnants of the family together. If you're president of a bank or own a thousand-acre farm in California, you probably won't like this book. Indeed, such people raised a furor when TGOW was first published. It was banned in some places, and burned in others. Which is of course ironic, since it is well known that public interest in a book is directly proportional to the number of times it is requested to be banned. Also, you can tell after 50 pages or so, that this is not a sunshine-and-puppy-dogs, happy-ending book. Finally, at 581 total pages, this is not a book to start on Sunday night, when you have a book report due on Monday morning. What makes The Grapes of Wrath something special? In 2009, it will be 70 years since TGOW was first published. It isn't showing its age at all. The poor and the displaced are still with us, and are still getting shafted by the rich and the powerful. And those who help the have-nots will receive their share of the oppression. Casy the Preacher in the story gets labeled a Socialist and/or a Communist (and loses his life) merely for trying to organize the farm workers. Steinbeck got called the same things in real life in the 40's. Curiously, in the 60's, it was the left who called him a turncoat because he was sympathetic to the war effort in Vietnam. In truth, Steinbeck was a populist. He supported the powerless, and whatever it took to enable them to live decent and happy lives. The personal cost was enormous. Besides being slandered and labeled a Commie, the FBI kept tabs on him for years. In the end, things haven't changed much in 70 years. If you stand up for the little people, you must be prepared for the inevitable smear campaign. You will be called a Socialist, an elitist, an Al-Qaeda operative, a Muslim, an Arab, and a collaborator with revolutionaries. Just ask our president-elect. To close, this is a great book. It spotlights the plight of the have-nots, provokes thought, encourages activism, and oh-by-the-way is a literary masterpiece. Highly recommended. Oh I'm so glad you liked it!! Really, this has got to be one of the best books I've ever read. I can't believe I spent years avoiding it, and thinking it'd be awful. I almost didn't choose it for the book club list in 2008. I'm so glad I did! What you say about the minor characters is really one of the key points in Steinbeck's writing. Every single sentence in that book was deliberate. Every character, ever plot point, every setting description...really, this is a masterpiece if I've ever seen one. I absolutely loved East of Eden when I read it, and I intend to read Grapes of Wrath this year. Thanks for this high recommendation. I'm looking forward to it so much! I haven't read this since senior year in high school, but it is one that I actually remember a lot about. This is probably the book that made me really fall in love with literature. there is a depth to this book that simply amazed me. there's a number of topics that i didn't touch on in the review, out of concern for its length. for instance, all of the characters are "gray". none of them is all good, and none of them is all evil. even the deputies and the thugs are just acting out of fear - fear of losing some of their possessions to the migrants. which Steinbeck admits was a distinct possibility. then there's the whole issue of sharecropping, and the okies losing their farms as that 'arrangement' became economically untenable. in truth, their displacement was nobody's fault; it was merely a sad consequence of progress. finally, the government camps might be viewed as a communistic plug by Steinbeck. but in reality, conditions in those camps were a lot more wretched than what he describes. he "prettied them up" so that they wouldn't distract from the main storyline. Great review - I'm put this on my To Be Read list!